I work for Thomson Reuters, and in January, our brand marketing team solicited responses from employees around the world. They regularly showcase the people who define our culture, and in this instance, they were interested in our activities outside the office. Since I’m passionate about writing – and <cough> always looking for an opportunity to share and connect with others – I wrote the following submission. Somehow, I managed to keep it under 300 words, which is nearly impossible for a writer writing about the book he’s writing. 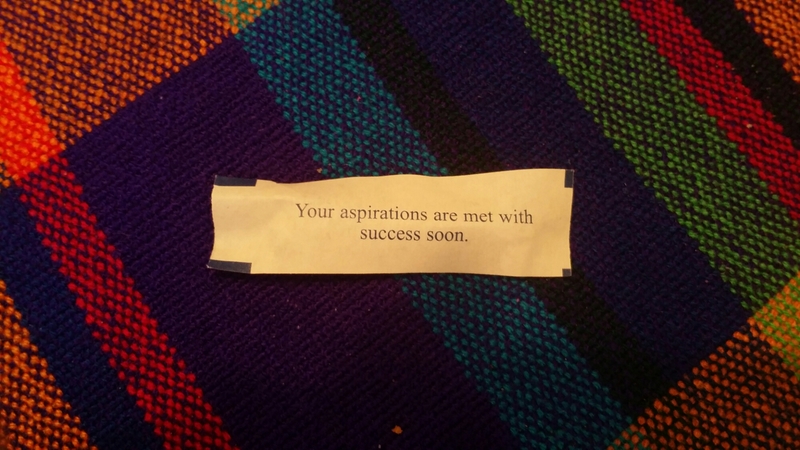 Because they’re not really fortune cookies, are they? This post is approximately 400 words. Sometimes the writing can be an obsession. You’ve hardly enough brain power or typing ability to keep up with the flurry of thoughts racing across the vision of your mind’s eye. And sometimes, you need a break. Maybe not from writing in general and certainly not from creativity. But another outlet, perhaps. For me, this occurred in late April. I’d been writing pretty consistently for four months: through the holidays, through one of the busiest and most stressful points in my corporate career, and through those long Minnesotan winter days when we all go a little stir crazy. I was happy with my progress, which had been more satisfactory than most other writing periods in my life. Still, I needed to take a step back. Six out of nine ain’t bad. Wait…is that a MySpace logo? Six out of eight. I found that starting on the marketing – the social presence – of the book series was an excellent way to keep my writing and creative energy going. I now had outlets for blogging and photography, for sharing inspiring landscapes or thoughts on books. When there are too many distractions or I’m walking a dog, I can still be doing things to promote the project. It also allowed me to put into practice many of the things I’ve learned about digital marketing over the last ten years. It’s a welcome distraction, but hopefully, not too much of a distraction from the most important part of the project: the book itself. At 72,000 words, that’s quite an investment of time. I’d hate to derail myself by spending too much time away. Believe me, every day away from the manuscript makes it that much harder to return. Fortunately, the words for the first book are still flowing, as are ideas for the next books in the series. Honestly, that’s the greater danger: the excitement of a new project when the current one has its luster smudged a smidge (more on that in a future post). For now, my time on the project is split between the manuscript and things like this website, which I’ve soft-launched until I’ve finalized all the details. Expect more updates like this: May 31 is my deadline for the first draft of book one.